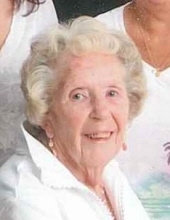 Louise Warnken, 93, of Bloomington and formerly of California, passed away at 10:54 p.m., Tuesday, February 5, 2019 at OSF. St. Joseph Medical Center in Bloomington. Funeral services will be held in California. Carmody-Flynn Funeral Home, Bloomington is assisting the family with local arrangements. Louise was born January 29, 1926 in Kentucky, the daughter of William Bernard and Charlotte Ermine Shipp Mardis. She married Alvin E. Warnken and he preceded her in death. She is survived by a son, Jim Warnken of California; a sister, Gloria Haley of Odell; and several nieces and nephews. Louise was preceded in death by three sisters, Bernice Chambers, Maxine Fry and Judy Mardis and two brothers, Bill Mardis and Bob Mardis. Louise worked for Pan American Airlines and Shirley Temple Black. "Email Address" would like to share the life celebration of Louise Warnken. Click on the "link" to go to share a favorite memory or leave a condolence message for the family.